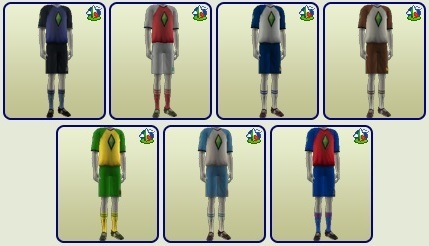 Mod The Sims - Sayonara, soccer outfits! I absolutely despise the soccer outfits that came with Free Time. Not only do they look frumpy, but without fail every single sim of mine that ages up gets this as their athletic outfit. Well no more! This mod hides the outfit worldcupep7 for all ages and all genders. Simply put the file in your Downloads folder and enjoy the tranquility that comes with knowing you will never again have to see those outfits in your game. If for some reason you decide you want the them back (why? WHY?!) just remove the file. Will conflict with other hider mods for these outfits. If you have default replacements then you won't need the hider since your new, more attractive athletic outfits will show up instead! EDIT: Since CM have only the soccer outfits in their athletic wear, it is advisable to have a CC option available for them. In my game most of my CMs had an everyday outfit put into their athletic wear, but I did have one or two that were forced into the soccer outfit regardless.